What is it about getting a new planner that just makes you feel like you’re off to a fresh start? New paper, new goals to list, and no clutter. Yes, please! 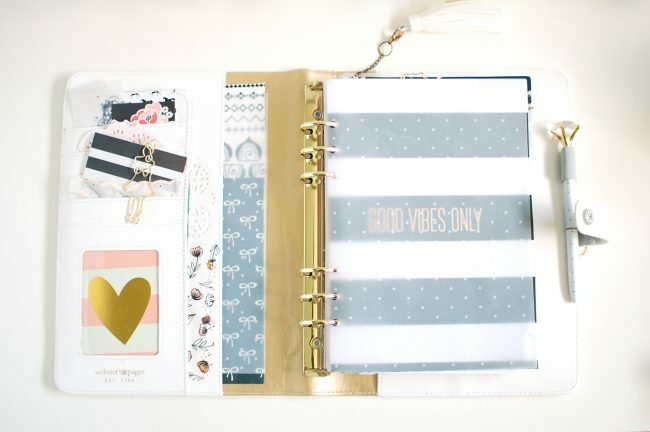 Getting a new planner ready can be a lot of fun as you get everything put together and ready for a new year. It can take a lot of time, though if you’re making any changes to your system! This year, I’m changing a lot. 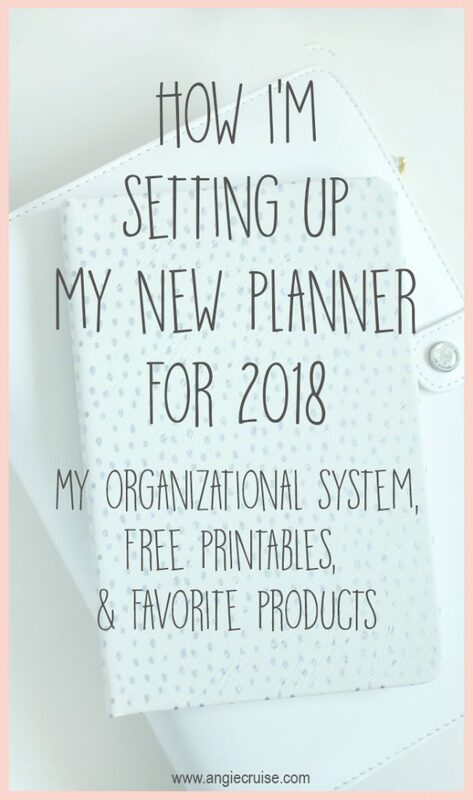 I bought an entirely new brand of planner inserts, came up with some new systems, and made some new printables. This year, I bought a lot of new supplies. It was a lot of fun, and I thoroughly enjoyed buying so much at one time. I don’t normally allow that, because I’d go broke! But once a year, I allow myself to shop as much as I want while I get ready for a new year. I shared my planner haul in this post, if you’d like to see me on a shopping high. This post contains affiliate links. To learn more about what this means, see my full disclosure here. What I love about the ringbound system is that I can add and remove things as I please. My coilbound planners were great, but I was always missing something, and always had pages that went unused. 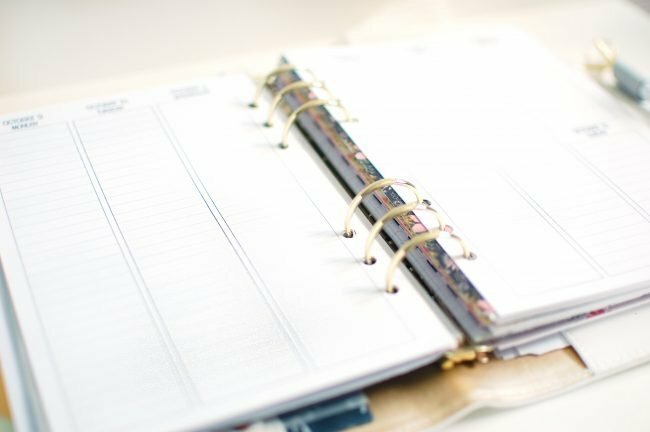 So, how do I set up my planner? Let’s go through each section! I like to keep my personal schedule separate from my work schedule. It’s one of the reasons I went with a ring-bound planner. Keeping everything separate helps me focus on the task at hand and not get distracted. So, this section houses everything to do with me and my family. It contains monthly calendars, weekly calendars, our monthly budget, and my personal goals and inspiration. For this section, I purchased the half-letter month on 2 pages (single sided), and the half-letter vertical lined WO2P inserts from Sew Much Crafting on Etsy. I’d heard raving reviews about her inserts all over the planner groups, and I can say they do not disappoint. She has several options in her shop, but this allowed me to keep a similar set-up to what worked last year. I’ve tried a lot of different things over the years in my monthly set-up, but so far what I’ve found to work best for me is a simple decoration (just to make it pretty) and Pilot Frixion Pens in black. I like these because plans change, and I can erase them instead of having scratched out plans all over my planner. I write down everything that needs to be scheduled in my monthly calendar. Then, each weekend, I sit down and transfer everything coming up to my weekly schedule. This is where I plan it out by time, and work my to-do list in around my schedule. It’s how I know what times I’ll be able to work, and whether I can fit in a big project or not. In my weekly set-up, I do use stickers, but I still keep it pretty simple. Actually, I like to say that what I’m doing is actually time-blocking, but with stickers! 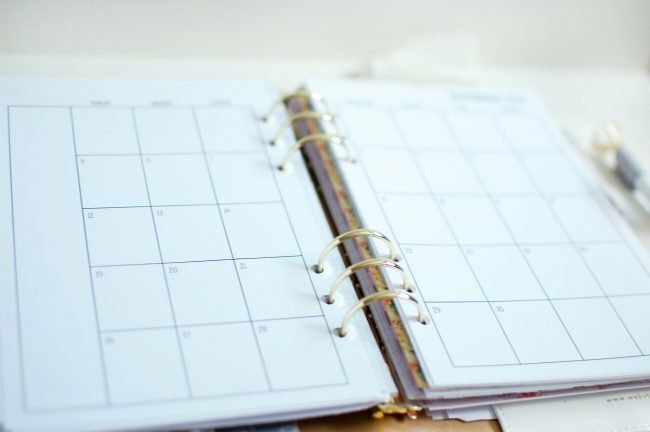 My blog editorial & social media calendar. This section is pretty self-explainatory. Every month for my blog, I plan out what posts I’ll be publishing. This helps me keep things balanced, and keeps me from scrambling to figure out what to write. I find that when I don’t know what post comes next, I put it off until the last minute and then scramble to get it written the night before. It’s not my best work, as you can imagine. I like to be able to think about a topic, figure out my thoughts, and get an organized blog post put together. It’s so much better for everyone! The same goes for my social media posts. If you run a business or a blog, I’m sure you can relate to the pressure of having to post something every day. It can get stressful! I fumble and end up posting a bad picture or a really rambling caption that makes no sense. No one likes that. So, I keep a social media planner as well, and figure out what I want to post every day that week. Also in this section is a page that I’m using to write out my goals and action plans for each month. These pages have been a huge help for me this past year, so I’ll be keeping it up! My next section is almost entirely dedicated to my Young Living business. In this section, I keep my monthly stats and income, ideas for my team, and track my growth each month. Each business will have different needs in regards to what they track, so I won’t go into specific inserts here. Most are printables I made for my own personal use and for my team to use. 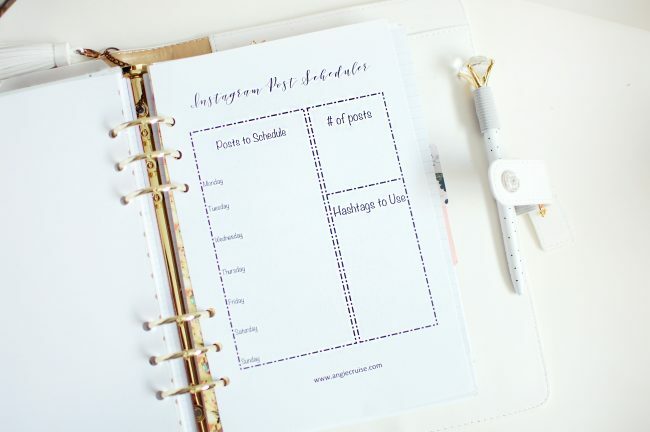 I do have another social media planner in here as well, so I can keep track of ideas on what to post. Again, I freeze up when I feel pressured to say something! Notes! Can I be completely honest, here? I think being able to have as many notes pages in my planner as I want is one of my favorite features of the ring-bound planner. I never had enough notes pages in my other planners, so I never used them for fear of wasting them on something unimportant. Now, though, I write notes about everything! I brainstorm new essential oil class ideas, think about blog posts I’d like to write, jot down my favorite quotes (which usually become Instagram posts), etc. There’s no limit to what I can do with my notes section. I’m always jotting something down! In this section, I’m using a pack of Carpe Diem note-page inserts from Hobby Lobby. It came with both lined pages and gridded pages, which I love! In the very back of my planner, I keep some of my personal info. This includes passwords for our online bill payments, a tracker I’m using to pay off credit-card debt, and notes I jot down for birthdays & holidays. This is my least-used section, but I keep this information in my planner because otherwise, it’d get lost! I hope you enjoyed this walk through of my new planner setup! 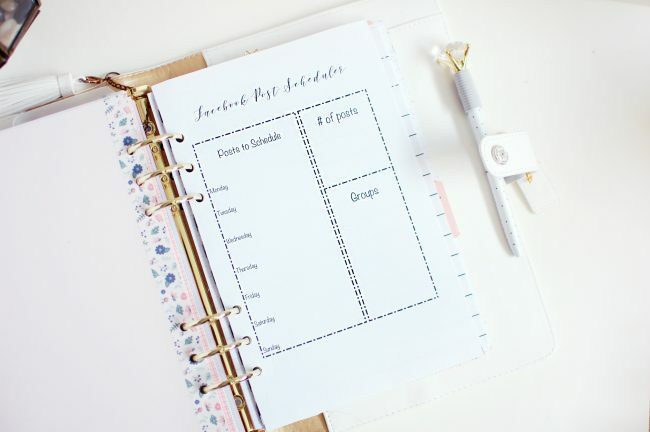 Don’t forget, if you liked any of the printables shown in this post, you can download them for free! You just need to sign up here and the info will be sent to your inbox. question. i’m a HUGE note taker as well. what do you do with your “notes” once you’ve used them for whatever they were written for in the first place? just rip & toss? or? Hey Rhonda! I rip out my to-do lists and toss them. I keep everything else! I have books full of old notes, brainstorming sessions, and ideas that I never used. I flip through them for inspiration and reminders sometimes!